Century 21 Cambodia and Morgan Ford Investment yesterday signed a memorandum of understanding to promote unit sales at Morgan Tower, a $160-million multi-purpose business centre now under construction in Phnom Penh. Party to the agreement is also Century 21 China, a major real estate agency in China. The project, located in the rapidly developing area known as Koh Pich, will have 46 floors and will rise 210 metres above the ground. Construction began in August and is scheduled for completion in 2021. It will boast a 4.000 square metre rooftop bar, a Michelin-star restaurant, a luxury swimming pool and a helipad, the developer said. Hu Sheng Gang, vice president of Morgan Ford Investment, said his company has built a reputation for successful development projects in Cambodia during the last 10 years. 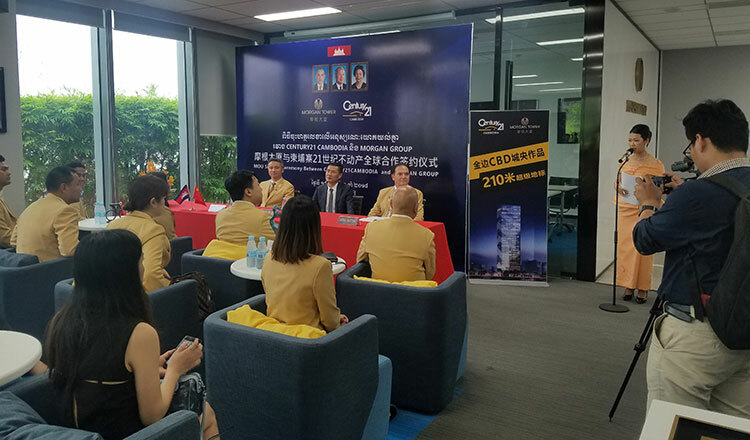 “This long-term partnership with Century 21 Cambodia and Century 21 China will provide more real estate services to those interesting in purchasing units in Morgan Tower, incluidng leasing and reselling. “We decided to invest in Cambodia because the country has a good relationship with China. We decided to invest in the best location: the heart of Phnom Penh,” Mr Hu said. Seraj Sutton, Century 21 Cambodia CEO, said the project will become a new landmark in the capital that will allow buyers to enjoy one of the best views of the city’s skyline. “Century21 Cambodia will be promoting the project through 21 local franchises in Cambodia as well as through Century 21 subsidiaries in China, Taiwan, Japan, Hong Kong, Singapore, Australia and the United Arab Emirates. “In Morgan Tower we saw a project that matches our quality standards and is up to our reputation, so we decided to cooperate with the developer to promote the project inside Cambodia and abroad,” Mr Sutton said. Presiding over the project’s groundbreaking ceremony in August, Cambodian Deputy Prime Minister Hor Namhong said China continues to play a crucial role in developing the Kingdom’s infrastructure. In the last five years, Chinese investment in Cambodia has amounted to more than $21 billion, he said, adding that China has built nearly 3,000 kilometres of roads and seven bridges during that time. In the first half of this year alone, Chinese investment equalled more than $5 billion, Mr Namhong said.